Just like any corporation, these colleges and universities have earned the right to reap the benefits that a popular mascot brings to a school through the merchandising of all the possible items that a mascot logo can be applied to. It’s not too different than if someone tried to list Stanford or Harvard on their résumé or C.V. when they only went to a local junior college, or state college but they would like to reap the benefits of what a more “prestigious” school would bring without having to make the same financial and academic commitments that it takes. Are these “poor little ‘ol high schools” helpless if they want to have a dynamic-looking mascot that captures the spirit and pride that they are trying to instill into their student bodies? No, there is a plethora of design resources available to any high school or school district, but the sad reality is that for the most part, these schools and districts have no idea how to valuate their need for a good mascot identity and rarely (if ever) budget accordingly the necessary funds to enlist the services of a talented designer or agency and are then shocked when they do have to scramble to seek out pricing for a new logo in the face of a cease and desist letter. The first instinct is to do a hasty Google search of their particular mascot only to realize that all the good versions already belong to another college or university or if it is free clip art, it is so hokey that they would be ashamed to have on any uniform or helmet (that’s your first hint of the value of a good design). Usually the second option is to quickly organize a “logo design contest” for the students in the art or graphic design departments. While there is a chance that a particular school may have a budding talent in their midst that may be able to hit a home run with a winning design that everyone falls in love with (I’m still trying to get my old high school to consider a design I came up with back when I went), but that would be the rare exception rather than the rule. The reality is usually the best submitted designs are not much better than the cheesy free clip art that everyone would be embarrassed to wear. So, what to do? While I wouldn’t mind taking in a lot of mascot design work (contact me at (208) 640-0022 or go to my Contact page) if you wanted to keep it local, search for a good design firm or designer in your area. I would use the keywords “identity design” rather than just “logo design” as with just “logo design” you will be absolutely overwhelmed with the amount of options to wade through and try to figure out who’s legitimate, who’s affordable and what do you actually get when you purchase a design. A big thing to consider is most so-called logo design sites will only get you a logo in maybe two file formats. You’re on your own if you want to know how to use the files and apply it to all the items that need to be branded. That is why you want to search for identity design. Identity takes into consideration the whole package, not just the actual logo or mark design. An identity designer will help you apply the design to all your needs as well as probably come up with ideas you may never have thought of. The identity designer will also have a more comprehensive understanding of the whole branding process and how to think through those issues in applying a well-thought out mascot design. For instance, there are many different applications of a typical logo that most people don’t realize. There is at a minimum at least of a positive version and reversed version to go on different backgrounds in addition to 4-color, 2-color and 1-color applications. Many times there are horizontal as well as vertical versions to be placed in different layout situations. Then there are the different sizes of each versions—usually at least three sizes (small, medium and large) and those sizes have to apply to the positive and reversed, horizontal and vertical versions of the design. Then you also have print versions and on screen versions. It is not uncommon to have between 30 and 50 and sometimes into the hundreds of different possible iterations of the logo for all possible applications. Usually, just like a corporate identity, a college or university will also have a graphic or style usage guide produced that shows how the logos are to be applied and which logos to use in different situations. All of this takes time and resources and can quickly add up. While a typical high school dealing with constantly shrinking budgets may just find that scale of investment impossible, it should at least factor in a realistic budget for an identity solution on the lowest end of between $1,500 to $2,500. More comprehensive solutions will be $5,000 and up. But a good designer or design firm should be able to discuss what your absolute minimal needs are and be able to work within your budget. While there are many places that offer $500 logos (and even less), beware of what they actually promise to deliver, because you will most likely be left with just a JPEG and an EPS version of one logo design and you will be at the mercy of whatever interpretation of how to use the files that your vendors will invariably come up with if not directed correctly. Once any school goes through this process, they will begin to realize why the big schools place such a premium on the value of their trademarked identities and after any school has put that much effort into their new school mascot and then they see another school “borrow” their mascot design without going through the same financial commitment to the process, they’ll appreciate why the big schools aggressively protect the use of their trademarked designs. At the NCAA university level, an identity design budget will typically fall in the range of between $10,000 and $20,000 and can easily exceed $50,000 for larger schools with many different program, print and signage applications. They’ll also appreciate why “borrowing” is actually “stealing” when they realize that someone else is using something that cost them nothing (further eroding the perception of the value of good design) and benefitting from the substantial investment of someone else. That goes even beyond lying about where you went to school on your résumé to claiming to be someone else entirely and being hired for their accomplishments and not yours. And finally, the pride of ownership of your school’s own, unique identity is priceless. 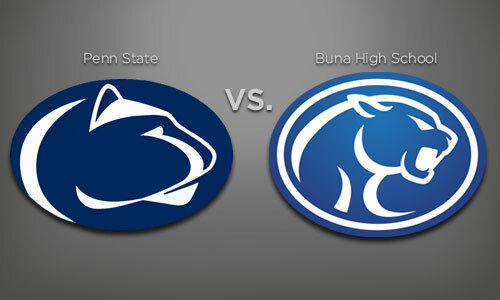 Buna High School can now be so much more proud of their own cougar than the “lifted” Nittany Lion they were using for years knowing that they are the only school in the country with that logo. Not even Penn State can say that. I’ll leave the issue of whether a high school should go through the effort of trademarking their own mascot like the big schools for a future post. I think its stupid when i see other highschool teams with NFL and College logos and they dont say not a thing to them?!?!? !